Young farmer Alvin York (Gary Cooper) is a cussin' hell-raisin' critter in Tennessee Valley. All of this changes when York is struck by lighting during a late-night rainstorm. Chalking up the bolt from the blue as a message from God, York does a complete about-face and finds Religion, much to the delight of local preacher Rosier Pile (Walter Brennan). Despite plenty of provocation, York vows never to get angry at anyone ever again, determining to be a good husband and provider for his sweetheart Gracie Williams (Joan Leslie). 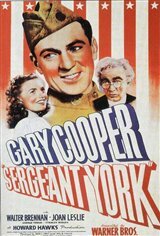 When America goes to war in 1917, York elects not to answer the call when drafted, declaring himself a conscientious objector. Forced to go to boot camp, he proves himself a born leader, yet still he balks at the thought of killing anyone. York's understanding commanding officer Major Buxton (Stanley Ridges) tries to convince the young pacifist that violence is sometimes the only way to defend Democracy. When York sees several of his buddies, including his best pal Pusher Ross (George Tobias), killed in an enemy ambush, he begins to understand what Buxton was trying to teach him.